Available in multiple configurations, the Infoprint 21 provides high-quality, reliable print output for small, medium and large enterprises. Designed for versatility in complex networking environments, the IBM Infoprint 21 delivers fast and accurate print output at up to 21 pages per minute. The printer includes a 100 MHz IBM PowerPC processor that ensures high performance, even when printing complex documents. Output can be managed from multiple heterogeneous environments, including legacy applications. Prepare for the next generation of computing while you help protect your current investment in systems and software. The Infoprint 21 meets the challenge of Internet business requirements by providing flexibility in accessing and printing documents. With standard Internet Printing Protocol (IPP), print jobs can be submitted over the Internet. The printer's resident Web site enables pull printing, where users provide the web address of PDF, PCL or PostScript files, and the printer access and print them. This saves download and file-print submission time. The Infoprint 21's software solutions can increase user productivity and reduce administrative support costs. Using the printer's internal Web pages and Network Printer ManagerTM (NPM) software, network administrators can easily set up, configure and manage the printer. E-Mail and pager alerts can be sent when the printer needs attention, maximizing up-time. As a result, overall resource consumption and total cost of ownership can be reduced. 1 This figure represents a maximum monthly printing rate. IBM does not recommend printing this monthly maximum on a consistent basis. 2 Additional memory may be required depending on printer configuration and print job complexity. 3 The 5th input source includes the 75-envelope feeder. 4 Yields tested to International Data Corporation's (IDC) "Cost Per Page and Page Coverage Standard for Monochrome Laser Printers". The e-business output of today requires instantaneous delivery, global data access, security, and individualized content. The IBM Infoprint 21 is a key component to help you achieve the transformation of your business to become more competitive and win in the marketplace. The Infoprint 21 is a 21 PPM laser printer designed for small to medium sized workgroups. Benefits and capabilities of the printer are described below. Infoprint 21 uses the IBM high performance controller with a 100 MHz PowerPC 603e processor, IBM printer co-processor and an internal 64 bit data bus, 32 bit address bus running at 66 MHz. It has a Peripheral Component Interconnect (PCI) Bus for a Network Interface Card (NIC) and a hard drive. The processing power of the IBM PowerPC 603e processor is shown in the table below. Flash memory to support printer code upgrade. Web support for printing Internet formatted files and embedded Web server for configuration status. Advanced IBM Print Quality Enhancement (PQE) algorithm for enhanced 1200 DPI print quality without additional memory. Two memory slots that support any combination of 32 MB to 128 MB memory DIMMs for a maximum of 256 MB of SDRAM memory. Memory upgrades may require removal of the 32 MB memory DIMM that comes standard. Infoprint 21 supports full page processing so there is little chance of data loss due to page compression. This option gives Infoprint 21 integrated support for IBM's AFP/IPDS in SBCS (single byte) mode. It is installed in an internal slot on the controller. A maximum of one of these can be installed and there are no pre-requisites for this feature. AFP/IPDS DBCS support is available using this hard drive feature. All the other functions supported by the hard drive are also supported (see Hard Drive description below). Only one of these can be installed and the AFP/IPDS (feature number 4820, P/N 38L1404) is a pre-requisite. This feature is mutually exclusive with the hard drive (feature number 4328, P/N 38L1408. This hard drive feature cannot be shipped installed in the printer and must be installed at the customer site. This optional resource flash memory module with a capacity of 4 MB or more allows PCL fonts, PCL macros, PostScript fonts, PostScript macros and DBCS fonts to be downloaded and temporarily stored using the Network Printer Resource Utility (NPRU). A maximum of one of these can be installed and there are no pre- requisites for this feature. This feature is mutually exclusive with the Japanese PostScript DBCS Font Module (feature number 4010, P/N 02N8571), standard on Model 003 (Japan) and SEMEA PCL Font Module (feature number 4830, P/N 02N8574). PCL fonts, PCL macros, PostScript fonts, PostScript macros and DBCS fonts may be downloaded and permanently stored on the hard drive using NPRU. Fonts and macros may be individually deleted from the hard drive. Infoprint 21 supports direct printing of PDF files only when a hard drive is installed. A maximum of one of these can be installed and there are no pre- requisites for this feature. This feature is mutually exclusive with the AFP/IPDS DBCS Resource Hard Drive (feature number 4850, P/N 02N8565. This hard drive features cannot be shipped installed in the printer and must be installed at the customer site. This feature, intended for AS/400 customers, contains the IBM Ethernet 10/100 adapter and the AFP/IPDS Module. A maximum of one of these can be installed and there are no pre- requisites for this feature. This feature is mutually exclusive with the AFP/IPDS Module (feature number 4820, P/N 38L1404) and the IBM Ethernet 10/100 Adapter (feature number 4162, P/N 38L1401). This optional font module contains Japanese DBCS for PostScript. A maximum of one of these can be installed and there are no pre-requisites for this feature. This feature is mutually exclusive with the Resource Flash Memory Module (feature number 4030, P/N 02N6434) and SEMEA PCL Font Module (feature number 4830, P/N 02N8574). This optional font module contains Arabic, Greek, Hebrew and Cyrillic PCL fonts. A maximum of one of these can be installed and there are no pre-requisites for this feature. This feature is mutually exclusive with the Resource Flash Memory Module (feature number 4030, P/N 02N6434) and Japanese PostScript DBCS Font Module (feature number 4810, P/N 02N8571). Infoprint 21 has a reproduction or "RePro" capability for generating multiple original copies of a document. This "RIP Once/Print Many" capability eases network traffic, improves performance for complex jobs, generates high quality output copies and reduces costs. Repro capability is supported using the standard RAMDISK function when either 96 MB or more memory is installed or the hard drive is installed. When an optional hard disk is installed, incoming print jobs can be spooled onto the hard disk if the printer is busy. Other types of jobs, such as PDF files, must be spooled because they cannot start printing until the entire job is received. Infoprint 21 supports up to two simultaneously active interfaces. Supports compatibility mode, reverse transform, nibble mode, and ECP mode. An IEEE 1284 Printer Cable is available (feature number 4180, P/N 38L1409). Ethernet interface using the IBM Ethernet 10/100 Adapter (feature number 4162, P/N 38L1401). Token-Ring interface using the IBM Token-Ring 4/16 Adapter (feature number 4120, P/N 38L1400). Twinax interface using the IBM Twinax SCS Interface (feature number 4141, P/N 38L1402). Coaxial interface using the IBM Coax SCS Interface (feature number 4171, P/N 38L1403). These four features are mutually exclusive and there are no prerequisites for these features. Only one of these features may be installed per printer. The maximum monthly usage for Infoprint 21 is up to 100,000 impressions. IBM does not recommend printing to this monthly maximum on a consistent basis. Note:(1) Output bins cannot be linked for high capacity stacking. This is the standard paper tray shipped with the printer. Order this option to stock extra trays. See the table of supported paper sizes in the input trays on previous pages. The paper trays have a visual gauge for the amount of paper available. There is no limit to the number of these that can be ordered and there are no pre-requisites for this feature. Up to two additional paper drawers, with 550-sheet trays, may be added for a maximum of three drawers total per printer. See the table of supported paper sizes in the input trays on previous pages. Infoprint 21 provides automatic input tray linking based on matching of media type and size between the input trays. The paper trays have a visual gauge for the amount of paper available. There is no pre-requisite for this feature. Optional duplex feature for two-sided copies. A maximum of one of these can be installed and there are no pre-requisites for this feature. Up to 75 envelope capacity. See the table of supported paper sizes in the input trays on previous pages. A maximum of one of these can be installed and there are no pre-requisites for this feature. This optional face-down paper output increases the output capacity by 500 sheets and allows offsetting of print jobs. A maximum of one of these can be installed and there are no pre-requisites for this feature. This optional Face-Up Paper Output has up to 100 sheet capacity. It is not selectable by the operator panel or the datastream but has a mechanical gate that is activated at the printer. Duplexing is not supported when the Face-Up Output tray is operational. A maximum of one of these can be installed and there are no pre-requisites for this feature. Infoprint 21 is intended to replace the IBM Network printer 17 in the IBM Workgroup Printer product line. Its primary market is the Distributed Mission Critical, general office and Reprographics. Its secondary market is Books, 1:1 Marketing and Direct Mail (proof printer). Infoprint 21 is designed to meet the printing needs of a variety of networks including Novell NetWare**, IBM LAN Server, Windows** NT, Windows 2000 and TCP/IP networks such as IBM AIX (requires optional Token-Ring or Ethernet/Fast Ethernet network cards). It can also be used with the AS/400 as a twinax attached printer (requires optional twinax interface) or with mainframe systems as a coax attached printer (requires optional coax interface). The minimum engine first print out time is 12.0 seconds. First print-out time is the time from when the printer receives a start printing signal in "READY" state until one sheet of paper is printed and delivered. From the time power is turned on until "READY" state is reached is approximately 60 seconds. If a second print job is sent within 90 seconds of the start of the first job, then the minimum engine first print out time is: 9.5 seconds. Paper Size               Simp. Dup. Simp. Dup. Simp. Dup. Simp. Dup. Note:Selection of a heavy media type in the printer driver automatically adjusts print speed and fuser temperature for best printing on the specific media. Card or label selection produces 14-17 PPM. Envelope selection produces 14 PPM for the first 20 continuous envelopes and 9 PPM thereafter. Transparency selection produces 14 PPM. Note:(1) Some print media, although they may conform to size and weight specifications, may still not perform to your expectations. Print quality, jam rates, fuser lif/be and output stacking can be affected by the printing environment (temperature and humidity) and characteristics of the paper (structure, moisture content, smoothness and thickness); refer to IBM Document G544-3915 for paper specifications. IBM STRONGLY RECOMMENDS YOU TEST ADEQUATE AMOUNTS OF YOUR PRINT MEDIA USING YOUR PRINTING APPLICATION TO ENSURE THAT YOUR PERFORMANCE EXPECTATIONS ARE MET PRIOR TO PURCHASING THIS PRINTER OR LARGE QUANTITIES OF THE MEDIA OR RUNNING LARGE PRINT VOLUMES. 11.5 mm maximum stack height. Up to 100 sheets copier/xerographic paper (20lb.). Up to 30 label sheets. 60 mm maximum stack height. Up to 550 sheets of copier/xerographic paper (20lb). 24.0 mm maximum stack height. Up to 75 DL envelopes. When Custom mode is detected by Infoprint 21, size mismatch is disabled and the paper is processed as if it were 431.8 mm long (17 PPM simplex/12 PPM duplex). All input paper sizes/media types are stacked in any of the three paper outputs, main output, 500-sheet offset and face-up paper output. Blank page suppression is supported for PCL 6 (PCL XL), 5e, and Postscript data streams. Envelopes               16 - 28 lb. 16 - 28 lb. 16 - 28 lb. Note:(1) Some print media, although they may conform to size and weight specifications, may not perform to your expectations. Print quality, jam rates, fuser life and output stacking can be affected by the printing environment (temperature and humidity) and characteristics of the paper (structure, moisture content, smoothness and thickness); refer to IBM Document G544-3915 for general guideline specifications. IBM STRONGLY RECOMMENDS YOU TEST ADEQUATE AMOUNTS OF YOUR PRINT MEDIA USING YOUR PRINTING APPLICATION TO ENSURE THAT YOUR PERFORMANCE EXPECTATIONS ARE MET PRIOR TO PURCHASING THIS PRINTER OR LARGE QUANTITIES OF THE MEDIA OR RUNNING LARGE PRINT VOLUMES. Note:(2) Duplex media supported only up to 28 lb. (105 gsm). Note:(3) Clear transparent film for laser printers or plain copiers is recommended. Note:(4) Supports the same weights as Copier/Xerographic media. Note:(1) AFP/IPDS does not support 1200 DPI printing. In order to specify AFP/IPDS Resolution support for 240, 600 or auto, the AFP/IPDS Print Mode must be set to Enhanced Mode (optimal print fidelity). In this print mode, complex (full page) image jobs may not yield optimal print performance, due to the increased print fidelity required to accurately render 240 and 600 DPI print objects. The AFP/IPDS Resolution of 240 DPI enhancement was provided to support customer legacy applications that use 240 DPI font, overlay and page segment resource libraries. Note:(2) The AFP/IPDS menu items for overlay cache and print mode are provided to allow performance optimization for complex image jobs. Use of these modes MAY require additional memory to achieve optimal performance. As with all mixes of jobs, memory utilization may vary based on number of jobs, job complexity and resource requirements. Infoprint 21 supports three high quality print resolutions: 600 x 600, 1200 x 1200 and 1200 DPI enhanced quality mode. The 1200 DPI enhanced quality mode is IBM's advanced technology algorithm that delivers superior image quality especially with images. This mode supplies 1200 x 1200 DPI print quality without the need for additional memory or processing that true 1200 x 1200 DPI output requires. The Infoprint 21 uses this enhanced mode as the default print quality mode. The printer also supports true 1200 x 1200 DPI at up to rated speed, 21 PPM. Infoprint 21 supports "Edge-to-edge" printing for all data streams and it may be required for legacy applications. If edge-to-edge printing is required, it is recommended that testing be performed to verify the print quality is acceptable. Edge-to-edge printing is supported to within 4 mm of the edge of the paper for the simplex side and 6 mm for the duplex side. The edge print quality degrades as the print approaches the edges and is not recommended for non-edge-to-edge printing applications. Infoprint 21 supports 256 levels of gray for PostScript and PCL 6. The print quality enhancements designed using IBM's advanced technology generates output quality using a knowledge based algorithm that maximizes end-user eye quality perception. The is accomplished using a state of the art data manipulation technique to optimize the toner particle placement. AFP/IPDS has up to 32 levels of gray supported. The default resolution for Twinax and Coax SCS is 600 DPI regardless of the resolution setting. The printer will convert 240/300 DPI AFP/IPDS to 600 DPI. IBM's toner saving technology, Econo mode will reduce toner usage while maintaining usable print output. It will increase the yield of the print cartridge up to two times by reducing the amount of toner placed on the printed page and significantly lowering the total supplies costs. Infoprint 21 has a simplified operator panel with scrolling capability. It consists of 8 keys, 4 LED status indicators and a 2 x 16 character display. The scrolling of text messages offers enhanced information for the operator. Attention - blinking when printer requires attention. Class B statements only true for parallel attachment with IEEE 1284 recommended cable. Other attachments are class A. Note:(1) Windows 2000 drivers will be available on the Web after GA. 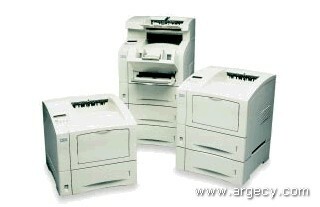 Note:(2) The printer will support OS/400 versions 3.2, 4.1 until they are withdrawn from service. Note:(1) The printer will support OS/400 version 3.2 until it is withdrawn from service. Infoprint 21 is supported as an ASCII (PCL) printer via a Workstation Customization Object under the Host Print Transform (HPT) facility of OS/400 V3.2 and higher. Information APAR II03291 describes the PTFs required in V4R3 and V4R4 to use this driver. Availability of the PTFs are 06/30/2000 for V4R3 and 07/31/2000 for V4R4. Note:(1) Windows 2000 will be available on the Web at GA.
Network Printer Resource Utility (NPRU) is an application that provides a repository (resource inventory) for fonts and overlays (macros) on a workstation with access to an IBM network printer. Once a font or overlay has been added to the NPRU inventory, it can be downloaded to RAM or optional compact flash or optional hard drive. Some drivers offer font and overlay download capability in the driver. See table below. The font formats supported are PCL Intellifonts and PostScript Type 1. Fonts and overlays that are downloaded are available to workstation applications when the network printer drivers are selected. NPRU is a separate program that uses the printer drivers to download. IBM provides the Network Printer Manager (NPM) Utility with an easy- to-use graphical interface for network administrators. Infoprint 21 is supported on NPM version 4. NPM runs on Microsoft 95/98/NT platforms. Network administrators can set-up e-mail or pager notifications for Infoprint 21. Whether printers are low on toner, out of paper or need attention, these notifications can get the information to the right source without delay, improving printer up-time and end user productivity. Some examples of the information available using SNMP are: on/offline, paper jam, out of toner, output tray full, input tray empty, and information about the printer's configuration, capacity, and number of pages printed. Integrates with standard Windows printer objects. Indicates that a job has completed printing and is ready for pickup. Detailed progress of a job on the printer (such as "printing page 3 of 7" or "copy 2 of 5"). The LPR Remote Printing Client utility provides a TCP/IP port monitor for seamless Windows 95/98 network printing. This port monitor can be used on Windows 95/98 to direct print jobs from Windows applications to IBM Workgroup printers. This utility supports other printers or print servers that run a TCP/IP LPD print server. The port monitor can be used on mobile systems for remote printing or it can be used on department print servers in an unattended print server mode. Web Pull Printing - Allows users to specify a URL address of a file for printing files from an internet source. Web Push Printing - This allows a user to select a file for printing directly to the printer freeing the client for other tasks and reducing network traffic. Administrator support and function (available to anyone with password protection). Two new methods of submitting a print job to the printer are available with Infoprint 21. They are referred to as (pull) and (push) printing. Files printed using Pull Printing must be in the correct format to be successfully processed. Supported formats include Postscript, PDF, PCL (5e and 6) and PJL. Supported transfer protocols include HTTP, FTP and Gopher via a proxy server. In order for the printer to reach a server that is on the other side of a firewall, the proxy server must provide access through the firewall. The address of the proxy server is a configuration item in the printer that can be set by the printer administrator. Pull printing provides a one step method of printing existing documents or forms that are available on many Web sites. Pull printing can also be used to update the microcode of a printer by entering the URL of the microcode update file. The microcode file can be retrieved over the internet from the IBM Printing Systems Web site (www.printers.ibm.com) or from a server configured by the printer administrator. Push printing also uses a browser to submit a print job. As with Pull Print, the user fills in an entry field on the Web page that identifies the name of an existing file to be printed. The user can also use standard Windows file browsing commands. For push printing, the identified file must be accessible as a local file to the workstation. After entering the name of the file, the user clicks the Submit button. The browser reads the file and transfers it to the printer. As with Pull Print, the file must be in a supported format: PostScript, PDF, PCL, PJL and ASCII text. IBM Infoprint Manager for Windows NT and Windows 2000. Infoprint Server feature of OS/390 V2R8. Infoprint 21 supports industry standard open-systems SNMP printer MIBs. When an optional hard disk is installed, incoming print jobs can be spooled onto the hard disk if the printer is busy. Other types of jobs, such as PDF files, must be spooled because they cannot start printing until the entire job is received. Other types of jobs (PostScript, PCL) can either be sent directly to the printer or be spooled on the hard disk. Some types of jobs, such as AFP/IPDS files, SCS and Appletalk, cannot be spooled because they require communication back to the transmitting host concerning their print status. Infoprint 21 allows the administrator to customize the printer so that all but AFP/IPDS, SCS and Appletalk jobs are spooled to the hard disk before printing. In some cases, this can reduce network traffic by minimizing the number of attempts to resend a job to a busy printer. The default spooling setting is to only spool when the printer is busy. The setting can be changed on the operator panel or from the printer's Web page. PSF/MVS 2.2.0 is withdrawn from marketing effective 3/31/99 and replaced by PSF V3.1.0 for OS/390. APAR OW39102 for PSF for OS/390 or APAR OW38078 for PSF/MVS 2.2.0 is required for outline font support. Note:(1) Requires AFP/IPDS DBCS Resource Hard Drive feature. The printer will support OS/400 versions 3.2, 4.1 until they are withdrawn from service. Note:(1) Infoprint Manager for AIX V3.1 requires APAR IY07502. Note:(2) Requires AFP/IPDS DBCS Resource Hard Drive feature. In addition to the AFP/IPDS enhancements, a Hard Disk Drive (HDD) is available with preloaded Double Byte Character Set (DBCS) Outline Font Resources. This is important for applications that use double byte characters. This feature requires the AFP/IPDS feature (feature number 4820) described above be installed as a pre-requisite. The coax or twinax interface uses PCL fonts when operating with a non-AFP/IPDS host data stream. Imbedding of PCL and PJL commands in the SCS data stream is possible. The printer selects and uses these PCL fonts differently depending on whether the attachment is coaxial or twinaxial. With the coaxial attachment, fonts can only be selected by specifying characters-per-inch (CPI). With the twinaxial attachment, fonts can be selected by specifying either CPI or an FGID (Font Global Identifier). Infoprint 21 supports the following PCL Symbol sets. Adequate site, system and other vendor preparation. Receipt at the customer location and placement of the printer. Installation and configuration of the printer and features by following the installation instructions. Loading print media and clearing jams. Order and installation of usage kits, supplies and consumables. It is the customer responsibility to order and maintain an adequate inventory of toner cartridges and usage kits. Printing the publication off the CD shipped with the printer. Downloading and printing the publication from the IBM Web site. Ordering the hardcopy publication using the order number. Infoprint 21 meets the EPA Energy Star specification of 30 Watts or lower. Infoprint 21 ozone emissions are less than 0.02 parts per million (ppm) for an 8-hour Timed Weighted Average (TWA) limit. This is less than the UL 1950 present recommended long term exposure limit for ozone which is 0.1 ppm calculated as an 8-hour TWA concentration. Note:(1) Approximate yield of up to 15,000 impressions has been established with an average coverage of 5%. An "impression" is defined as one printed side of a sheet. A duplex sheet would consist of two impressions. Note:(1) Includes a Fuser, Bias Transfer Roller (BTR) assembly and one feed roller set. Note:Significant use of heavy paper stock may impact fuser life. The above items are considered supplies and, as such, are not available from IBM service or included in the warranty or maintenance service agreement. Installation of usage kits is the responsibility of the customer. IBM paper and transparency film are manufactured to the tightest specifications and approved by IBM. They are designed for use with all quality printers, copiers, multi-function machines and fax machines and are also designed to optimize the performance of IBM printers. IBM Brand paper is stiffer and works well in tough applications. ** Company, product, or service name may be a trademark or service mark of others.Windows is a trademark of Microsoft Corporation. UNIX is a registered trademark in the United States and other countries licensed exclusively through X/Open Company Limited.